A leader in solar charging technology, the company inaugurates a program with 5 high-profile lithium battery brands to make advanced storage easier and more seamless for installers. Anaheim, CA, September 24, 2018 --(PR.com)-- At Solar Power International (SPI) on September 25 -27, Morningstar Corporation will be celebrating its 25th anniversary in renewable energy leadership and announcing a new program designed to make life easier for solar designers and installers: The Energy Storage Partner program, or ESP. The program makes it possible for recommended battery partners to offer additional value and support to their customers by providing them with a more proven, better documented and controlled storage system. Initially, Morningstar’s program is a joint effort in conjunction with five leading advanced battery brands: Discover Battery, NEC Energy Solutions, PowerPlus Solutions, RELiON, and SimpliPhi. This partnership between storage and charging experts will enable both to share and grow their competencies and deliver the full benefits of solar-plus-storage to end users. According to numerous industry studies, energy storage represents the driving growth segment in solar. Residential storage alone in North America has a projected Combined Annual Growth Rate of over 80% between now and 2021. Both off-grid and grid-connected energy storage will experience comparable growth in rural, security, communications and other applications. Morningstar’s ESP program is designed for simplicity and transparency. At the Recommended Level, it first involves testing and evaluating batteries to ensure compatibility and quality. Next is documenting all critical commissioning information needed to successfully set up an “open loop” or add-on energy storage system, including set-points, charging data, and relevant settings. Finally, an additional Recommended & Certified level supports “closed loop” systems with a higher level of interaction and control between system components. This level offers pre-sets and custom options along with comprehensive documentation, achieving a truly “plug and play” system built to fully-mapped standards. The ESP program goes into effect October 1, 2018, with the five partner battery brands. 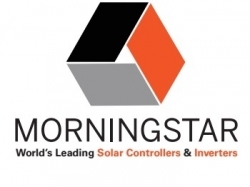 Morningstar’s flagship TriStar and ProStar solar charge controllers will be the first products used in the program. See Morningstar’s new program and other innovations at Solar Power International, booth 1924, September 25-27. About Morningstar: With well over 4 million products installed and sold since 1993 - in some of the most extreme environments and mission-critical applications in the world - Morningstar Corporation is truly “the world's leading supplier of solar controllers and inverters.” The US-based privately-owned company is headquartered in Newtown, Pennsylvania, with an engineering research and development center in Maryland and a global network of dedicated, best-in-class distribution and manufacturing partners.